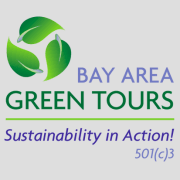 Bay Area Green Tours (BAGT) serves as a conduit to solutions for a more sustainable future. BAGT is committed to focusing on positive, innovative solutions and models. Tours are offered for companies & conferences, and for young people who are able to connect to role models and organizations which inspire them towards environmental activism and career paths. Participants learn about innovative green-certified businesses, people & organizations in the nation’s environmental epicenter, enabling them to find resources or take action to help mitigate climate change and live more sustainably. Would you recommend Bay Area Green Tours?